I've done a lot of mapping on this blog in recent months. Much of this has been about deprivation and my attempts to make more widely available maps on deprivation for different parts of the UK. For this, I've often used Google's Fusion Tables. The most recent work I've done with this data using Fusion Tables is to update the Welsh Deprivation work to include the most recent release of the Welsh Index of Multiple Deprivation from 2011. There's a screenshot below which links to a full page Google map. 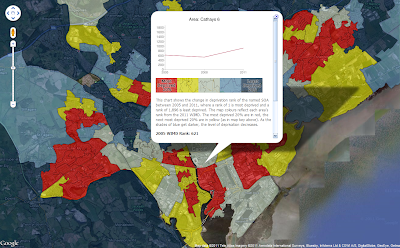 If you click on an area the pop-up will tell you all about it in relation to the WIMD data. This post isn't about the data but the most deprived area is in West Rhyl and the least deprived in Cardiff (Llandaff area). But this post is about methods, so more on that before I go... The steps below relate to any kind of data I've mapped using Fusion Tables (warning: technical content!). 1. First of all I usually have to join attribute data to spatial data. I do this in ArcGIS but it works well in MapInfo too. If you're a MapInfo user and want to follow the steps below, use Universal Translator in MapInfo to convert the file to a Shapefile first. 2. I don't like overly detailed boundaries because of the large file sizes and often this exceeds the Fusion Tables file limit. So, I simplify the boundaries. For this, I use mapshaper, a great online tool. You can also use other GIS methods. 3. Then I use something called shpescape. This is a really great tool because it allows you just to zip your shapefile (i.e. the shp, shx, dbf and prj files) and then upload directly to Fusion Tables without having to convert to KML as an intermediate step. 4. Once there, all you need to do is go to Visualize / Map and then go to work customising things. This includes map colours and what appears in the Info Window pop up when you click an area. I've blogged on the Info Window code bit before. 5. If you want others to see it you must make it public. Just click 'Share' in the top right of the Fusion Table screen. That's about it. The Info Window code bit takes a while to figure out but you can do so much with it.